Personnel Lifting - Equipment designed for personnel lifting. Use of safety restraint harness recommended. Power Breaker RCD - Residual Current Devices protect from electric shock. Strongly recommended for electrical equipment used outdoors or in damp conditions. Protective Gloves - Gauntlets, PVC, cotton or rigger gloves for hand protection. Safety Footwear - To BS EN 345 for toe protection. Safety Helmets - Protect against falling objects. Compulsory on site. Bump caps protect from overhead obstacles. Truck - Items can be transported in a truck. 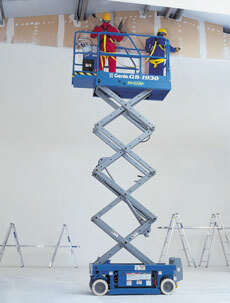 Self-propelled scissor lifts with pendant control that allows all lift and drive functions to be carried out by operators whilst the unit is elevated. Note: One person only when used externally. Do not use if wind speed exceeds 28 mph. Customers must provide proof of adequate insurance cover. *Weekend (3 for 2) price based on collection of equipment anytime from midday Friday, returning before midday on Monday. This will be charged at our weekend saver rate (this is less than our 2 day rate). Discount applied at the end of the hire.